This superb quality shower column has a multi-function shower head offering the options of rainfall and waterfall showering patterns aswell as a handheld shower head. This German manufactured shower tower is supplied in polished stainless steel with either a black or white glass front. A minimum of 3 bar water pressure is required to operate. * Multi-function overhead shower head. * Stainless steel with white or black glass front. * 2 or 3 way thermostatic shower valve. 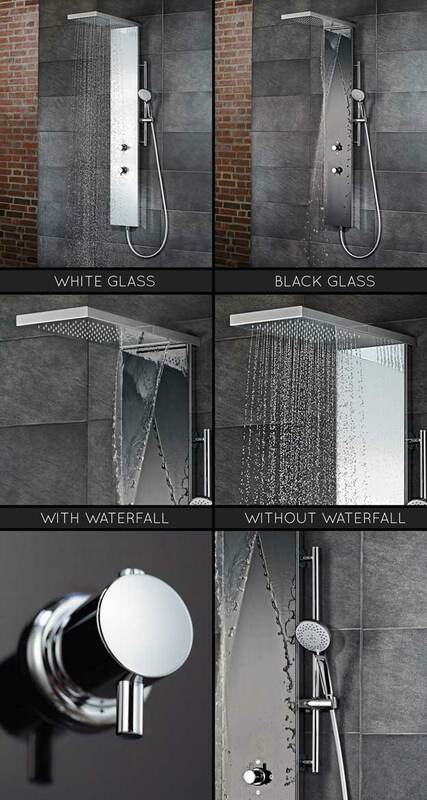 * With or without waterfall shower feature.